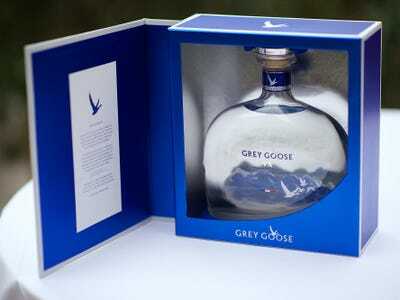 Grey GooseGrey Goose VX is 95% vodka and 5% cognac. Hybrid foods aren’t stopping at cronuts and ramen burgers — they’re coming for your cocktails next. Over the last year and beyond, craft distilleries and established high-end liquor brands alike have successfully marketed hybrid spirits. Creations like Grey Goose’s VX (vodka and cognac) Red Eye Louise’s Vodquila (vodka and tequila) and Jim Beam’s Kentucky Dram (bourbon and scotch) have all been at least moderately successful in boosting flagging sales. Wine combinations have also entered the mix, with Smoke (Moscato and vodka), Sutra (vodka and sparkling wine), and Ferdinands’s Gin (infused with Riesling) all jumping into the mix. That’s not to mention the runaway success of other flavored liquors, such as the now-famous Fireball. Grey Goose’s sales dropped unexpectedly more than 5 per cent last year, which may explain the sudden spirit of invention. Grey Goose, for its part, is also attempting to separate themselves from the flood of hybrids.